These two questions plague nearly every CEO, particularly in B2B, where long sales cycles and multiple touch points with prospects make it difficult to track whether your marketing budget is directly connected to conversions. How big should your marketing budget be? How should the size of your available budget impact the types of marketing investments to make? How should you allocate your marketing budget across all the different marketing activities and programs? How do you measure the impact of your B2B marketing strategy post-investment? 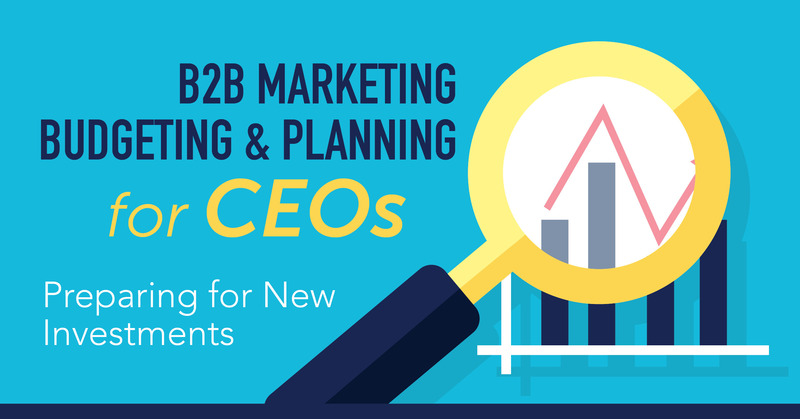 This post is a summary of our eBook, CEO Guide to B2B Marketing Budgeting & Planning: Preparing for New Investments. Download the e-book for more in-depth information, as well as example marketing budgets, infographics, case studies, and other related resources. 1. How big should your marketing budget be? That depends on whose advice you want to take. In a recent survey of 300 marketing leaders across the U.S. and the U.K., research firm, Gartner, found that companies are investing 10-13% of revenue back into marketing efforts, across people, tools, and advertising. Smaller companies generally fall on the lower end of the scale, with variability based on scale, innovation spend, and competitive pressures. What’s particularly interesting is that these budget numbers have been climbing for three consecutive years. In a survey of 349 for-profit top marketers in the U.S., The CMO Survey revealed that marketing spend accounts for 6.4% of company revenues for B2B product companies and 6.8% for B2B service companies. While we’ve seen the most traction in 10%+ investments, the reality is that it’s not always realistic, especially for companies that have been significantly under spending and can’t justify the massive shift in budgeting practice. Company size – The CMO Survey found that, on average, organizations under $25 million spend a higher percent of their revenue (12.2%) than larger firms (3.4-9.7%). In our experience, that’s not always true. For firms in the 10-50 employee range, we tend to see smaller budget numbers—companies that invest 4-8% of their revenues into marketing. Many of these firms start at the lower end and grow their investment over time as they better understand the role marketing can play in their growth—and more specifically, understand the right investments to make and expand. Startups with very limited revenue often need to spend irrespective of their revenue in order to achieve desired growth. Industry – The CMO Survey also found that marketing budgets vary widely by industry. Marketing spend is highest in the education space at 18.5% and lowest in mining and construction at 2%. For the sectors we work with most frequently, the report shows that professional services firms typically invest 9.4% of revenues in marketing while software and tech firms average 8.5%. Desired growth trajectory – If you’ve got aggressive growth goals, 10% marketing spend may not be enough for you. Salesforce, for example, spends 49% of its revenue on sales and marketing and its competitor, Marketo, spends a whopping 66%. While they’re some of the biggest players in the tech game, their year-over-year revenue continues to grow rapidly. In developing your marketing budget, you must factor in your desired growth trajectory. For many firms, that means thinking about marketing more broadly than lead generation and digital marketing and truly understanding the full scope of how marketing can help shape a growth strategy. Your Go-To–Market model – How you sell your products and services will change how much you allocate towards marketing. For example, if you sell through channel partners, you’ll want to factor in ensuring their sales and marketing teams have the resources they need to sell your product or service effectively—in addition to taking advantage of potential opportunities for co-marketing. If you’re a SaaS company, for example, you will want to ensure the numbers for acquisition and churn are balanced. Sales structure – Before investing in demand generation-focused marketing, companies must have the sales team in place to handle incoming leads (because if you’re doing it right, you will have them!). If the current sales team is completely inundated with prospect activity, the marketing dollars might be best spent on sales enablement to boost sales efficiency and impact. Alternatively, if the sales team is desperate for leads, it could be time to increase spend on demand generation. 2. How should the size of your available budget impact the types of marketing investments to make? Understanding the investment range that’s realistic for your firm along with overall business objectives and expectations from marketing helps set the stage for the types of investments that make sense for your company. Our clients find it helpful to think across three key investment categories: People, Tools, and Advertising. People: This includes staff and consultants and is inclusive of all investments that require a person to execute, such as marketing strategy development, program management, and content creation. Your “people” budget will depend on company type, environment, and stage of growth. For example, SaaS companies typically have heavy lead generation, qualification, and nurture requirements. They tend to invest more up front to set up and optimize the infrastructure for digital marketing to generate leads through digital advertising. As a result, budget for staff and consultants is often frontloaded to set up the marketing machine, and it levels off as marketing gains momentum. Services firms and companies that have highly consultative sales functions require thought leadership to set them apart, so their “people” hours stay pretty consistent. It requires constant, dedicated time to become a thought leader through content development, pitching contributed articles, social selling, and network expansion. As a rule of thumb, this number will likely represent the highest portion of your marketing budget and range anywhere from 50-75% of total spend. Tools and Technologies: Sales and marketing technologies have become extremely sophisticated, so much so that with investment in the right marketing tools, all digital activities and many offline activities can be tracked and measured to assess whether you’re making the right budget decisions for your business. The landscape of marketing tools and technologies has exploded and continues to grow across a wide range of categories. The basics include tools that support the infrastructure for marketing and sales efforts—CRMs (Salesforce, HubSpot CRM, etc.) and marketing automation systems (HubSpot, Pardot, Infusionsoft, etc. ), as well as the data that fuels program execution, such as sales intelligence platforms like DiscoverOrg and LinkedIn Sales Navigator). Tools and technologies are steadily climbing in terms of percentage of company budgets. This number may represent 15-25% of your marketing budget. Advertising and Sponsorship: Additional expenditure should come in the form of advertising, which can mean lots of different things. For professional services and tech companies, we think primarily in terms of digital advertising and selective event or association sponsorships. Digital advertising includes channels like Google AdWords, LinkedIn advertising, retargeting platforms, and performance-based content distribution. Sponsorship can include anything from a booth at a trade show to a paid speaking opportunity to a paid content syndication partnership with a key media outlet. This category varies widely in level of investment depending on the marketing strategy and associated plan. For many of our clients, it typically represents 10-25% of your total marketing budget. 3. How should you allocate your marketing budget across all the different marketing activities and programs? Within each of the three categories mentioned above, people, tools/technologies, and advertising/sponsorships, there are hundreds of places to spend on marketing, so the challenge is prioritizing what you should be doing of all the things you could be doing. Brand awareness – Your customer’s ability to recognize your brand, particularly against your competition—direct and indirect. Demand generation – Targeted marketing programs that help drive interest in your solutions and deliver leads to Sales. Sales enablement – Providing your sales team with the information, tools, processes and materials that help them sell better. What are we currently doing that’s simply not paying off? “What will it take to get there?” – Where do you need to spend this year to bridge the gap between where you are now and where you are looking to take the company? Some companies shy away from tech investments like marketing automation, even though efficiencies would drive major cost benefits. Others don’t make the investment in paid activity like event sponsorships because of the high-ticket price and unknown impact in terms of leads. Keep an open mind when it comes to figuring out where your marketing dollars should be allotted, and don’t forget the old adage—you must spend money to make money. 4. How do you measure the impact of your B2B marketing strategy post-investment? Measuring the impact or ROI of marketing programs is easier said than done. Let’s be honest: if it were easy, there would be far fewer blog posts on the topic. Marketing metrics are easy to obtain and readily available, but the ability to tie those to revenue and all of the other business benefits driven by marketing is much harder and more complex. While many people believe the best (or perhaps most straightforward) way to measure marketing effectiveness is through leads and sales, marketing can be pivotal to other areas of your business as well. Unfortunately, some of the most critical areas are tough to associate directly to metrics. Branding, positioning, and messaging – This work has a huge impact on where you fit into the market, how you prioritize and segment your targets, how you are viewed against competitors, and whether your solution and differentiation resonates with your potential customers. However, it is perhaps the most difficult to measure quantitatively. If you do it right, you’ll start hearing positive feedback from the market, but that may take months or even years. Eventually, this kind of work will result in larger sales from more of the right prospects, but there are too many variables to tie it back directly, short of over-investing in brand recall studies as is done in B2C and/or large companies. Brand awareness programs (social media, PR, ) – These efforts can directly correlate to near term sales, but often, we find the bigger benefit is in the long term or ‘pre-funnel’ stage. Making your brand known to your target audience helps sales get calls answered, encourages analysts and journalists to engage with your company, and increases the number of inbound leads and referrals. Brand awareness is notoriously hard to measure, but a critically important component of marketing. Sales enablement – Here’s one area where you will have to rely heavily on qualitative feedback. As you create tools and resources for the sales team to have at their disposal, you’ll be directly impacting sales, but you won’t necessarily have the numbers to prove it. That being said, this work can make or break sales activities, so don’t underestimate its importance among all of your marketing efforts. Sales enablement focused on increasing rep efficiency or lead funnel optimization can be easier to measure, but requires investment in the right tools and technologies and diligent adherence to sales rep and leader data entry in the CRM and other systems. Demand generation programs – Demand gen is generally easier to measure because you can tie activity directly to leads thanks to today’s marketing technologies. Don’t be fooled, though. In this area in particular, you can run through your budget quickly if you don’t have clear plans, expectations, timelines, and lead qualification requirements. In any case, you will not see demand gen results overnight. For example, depending on search volumes, PPC (pay per click) advertising generally requires a few months of runway to launch, optimize, and assess effectively. SEO (search engine optimization) typically takes approximately six months to see results and requires ongoing TLC to keep pace. The reality is that ROI for demand gen programs can be slow to realize. While it’s essential to keep a close eye on metrics whenever possible, it’s equally important to balance that with having faith in the system. For some programs, there will be clear metrics that prove the investment, but for others, you’ll be left wondering how to describe the value of all the incredible work that’s taking place. Have patience and understand that each of these disparate pieces fit together to create a powerful B2B marketing plan. Planning your marketing budget requires time, effort, and input from various stakeholders. Words of advice: be prepared to invest on an ongoing basis – marketing is not a “one and done” activity. In fact, companies that start and stop their marketing efforts are not only wasting valuable dollars, but are also at risk of jeopardizing their reputation; your audience will make their own assumptions about why things have suddenly gotten quiet. A solid, well thought out marketing budget will set you up for success throughout the year. Develop a budget that takes all of the above factors into consideration, but still leaves room for flexibility in case something unforeseen comes up. This post is a summary of Magnetude Consulting’s eBook, CEO Guide to B2B Marketing Budgeting & Planning: Preparing for New Investments. Download the e-book for more in-depth information, as well as example marketing budgets, infographics, case studies, and other related resources.